Help GALT Donate time to spread the word! Print and hand out literature for GALT. Do you walk your dogs every day? Every once in a while? Earn donations for GALT while you walk with either WoofTrax or ResQwalk! Download an app, sign up as a GALT supporter, and make every mile count. Just take your phone with you and start your walk on the app. Want to spread the word of greyhound adoption in an easy way? Personal checks can be ordered with the GALT logo. 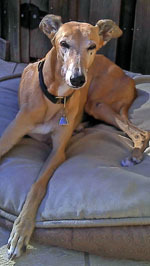 Use www.goodsearch.com to search the internet and money will go to GALT - learn more. The next time you're at Kroger, link your KrogerPlus Card to GALT's Neighbor to Neighbor Donation Program bar code account number 84687 or pick up a KrogerPlus application at the courtesy booth to fill out and link your card to our account. Kroger will pay us a percentage of your account total, so be sure to use your card every time you shop. 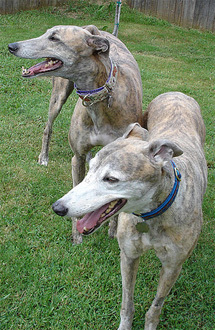 By using your card, you will be helping greyhounds within GALT’s care, as well as you will be eligible for many other special programs and offers. Here are the instructions for signing up or renewing: Instructions. You must renew your link to GALT annually - renewal period starts August 1st. The next time you're at Tom Thumb, link your Reward Card to GALT's account number 9805 or pick up a Reward Card application at the courtesy booth to fill out and link your card to our account. Tom Thumb will pay us a percentage of your account total, so be sure to use your card every time you shop. By using your card, you will also be eligible for exclusive discounts, giveaways, enter-to-wins, direct mail rewards, and Airmiles. Print out the card and take it with you to the store as your reminder of our organization's Good Neighbor Program account number – 9805 - to fill in on your Reward card application. For more information, visit TomThumb's Good Neighbor Program. If you have ever adopted a pet, Hale Pet Door will give you a 10 percent discount on your purchase. In addition, when you mention our organization they will match this amount with a donation for us. It’s all part of Hale's Rescue Rewards program to encourage shelter adoptions. For information, pricing and ordering, call (800) 646-4773. For more information, Hale Rescue Rewards Document. Read 52 Ways to Help GALT. Can you think of another way to help? Let us know!